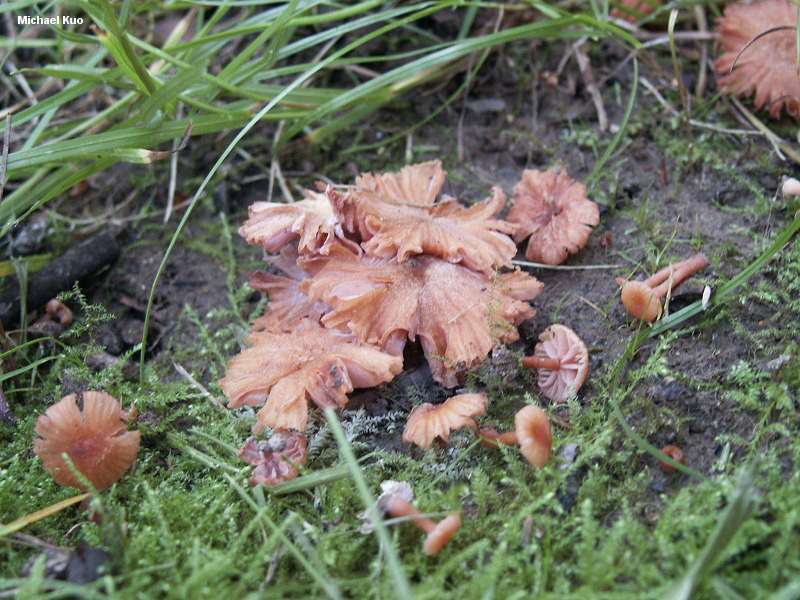 This little guy grows under hardwoods in eastern North America, and is one of several small, similar Laccaria species with orangish brown caps and flesh-colored gills. 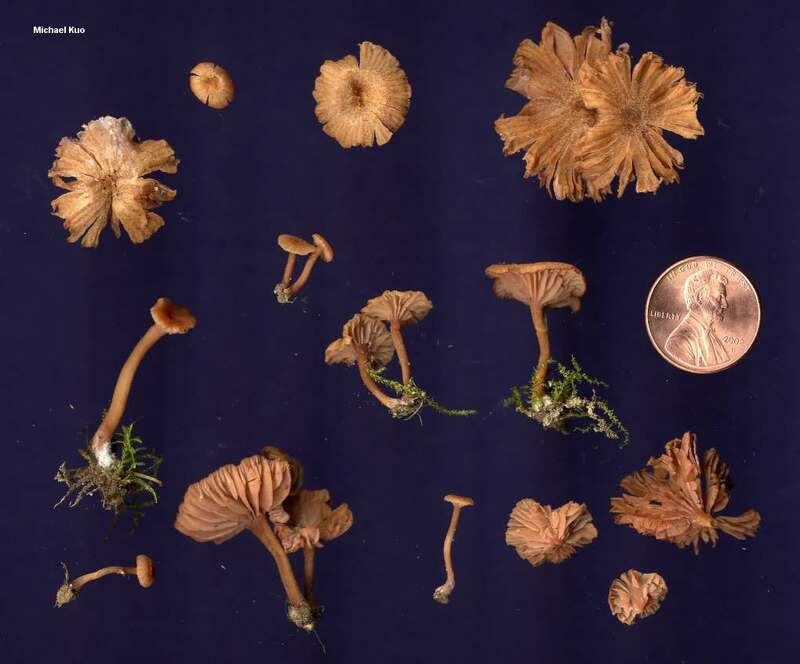 Thus, microscopic features--namely, the 4-spored basidia, and round spores featuring long spines that have very wide bases--must be matched in order to separate it reliably from Laccaria tortilis (basidia 2-spored, spores larger) and small forms of Laccaria laccata (spines on spores with skinnier bases), both of which can also associate with eastern North American hardwoods. 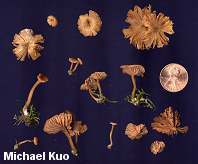 Ecology: Mycorrhizal with hardwoods; growing scattered to gregariously; not common; summer and fall; North American range not firmly established, but probably widely distributed, at least in the east. Cap: 0.5-2.5 cm; convex, becoming flat and sometimes uplifted; often with a central depression; usually prominently lined or grooved; bald or finely hairy; orangish brown to dull reddish brown, fading to buff; changing color markedly as it dries out. 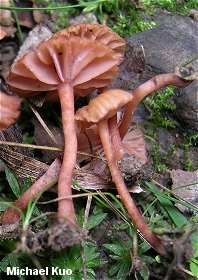 Gills: Attached to the stem; distant; pinkish flesh color. 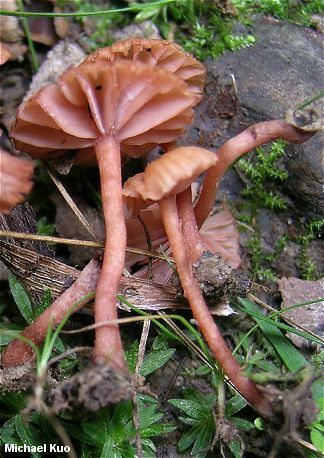 Stem: 1.5-2.5 cm long; up to 2 mm thick; equal or with an enlarged base; bald or finely hairy; colored like the cap; with white basal mycelium. Flesh: Thin; colored like the cap. Odor and Taste Not distinctive. 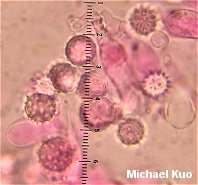 Microscopic Features: Spores 8-9 µ; globose to subglobose; ornamented with spines 1.5-3 µ long and 1.2 µ across at the base; inamyloid. Basidia 4-spored. Cheilocystidia usually present; filamentous or subcapitate. Pileipellis a cutis of elements 5-10 µ wide, with scattered bundles of upright elements; terminal cells subclavate to clavate. REFERENCES: (Montagne, 1856) Singer, 1946. (Mueller, 1991; Mueller, 1997.) Herb. Kuo 06080303, 06140303, 06280806.